1, 2, 3...Go! 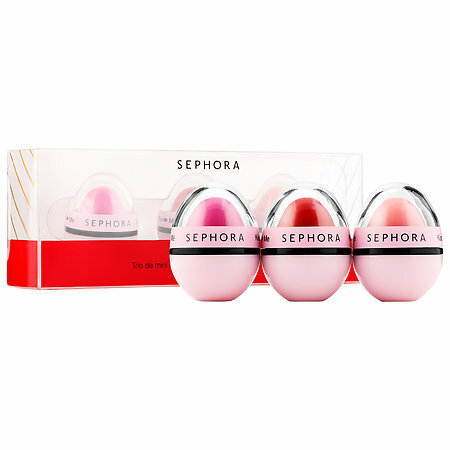 Stay on top of your beauty game with this adorable trio of mini-format Kiss Me Balms. Slip into your party purse, take one wherever you go! Three appetizing mini balms that you cannot get enough of, including one limited-edition tone specially created for this year's holiday looks! They come in colors like Charming, Pink Bubblegum and Cotton Candy. Right now they are sold out on www.sephora.com but they still have them in SEPHORA stores. These make the perfect stocking stuffers. For your daughters, Secret Santa, friends, whomever. These are great gifts. They were originally $12.00, but are on sale for $8.00 now. Scoop them up while you can!